관음보살은 여러 모습으로 중생 앞에 나타나 고난에서 안락의 세계로 이끌어 주는 자비를 상징하는 보살로 수월관음도에는 그가 사는 정토의 모습이 잘 나타나 있다. 이 수월관음도는 관음보살이 오른발을 왼쪽무릎에 올린 반가좌 자세로 바위 위에 걸터앉아 선재동자를 굽어보고 있는 모습으로, 『화엄경』의 내용 중 한 장면을 그린 것이다. 관음보살의 등 뒤로는 한 쌍의 대나무가 표현되어 있고, 앞쪽으로는 버들가지가 꽂힌 꽃병이 있으며 주위에 금가루로 원형을 그려 놓았다. 윤곽선과 세부 묘사는 붉은색을 주로 사용하였는데, 베일의 바탕과 주름선은 백색으로 그린 다음 금가루에 아교를 섞은 금니로 겹쳐 그렸고 안쪽에는 고려문양의 특징인 연꽃덩쿨무늬를 원안에 넣었다. 입고 있는 치마는 붉은색을 칠하고 백색으로 거북 등껍질 문양을 그린 다음 그 위에 먹선으로 덧그려 문양이 뚜렷하다. 이 그림은 1994년에서 1996년까지 보수작업을 통해 원래의 모습을 거의 되찾은 상태로 색채가 매우 양호하다. 전체적으로 안정되었고 고려 불화의 양식을 충실히 따르고 있어 수월 관음도의 시대적 흐름을 파악할 수 있으며, 섬세하고 절제된 아름다움을 느낄 수 있는 작품이다. Avalokitesvara is a bodhisattva symbolizing benevolence, one that leads people from affliction to happiness. He appears in various forms in different circumstances. 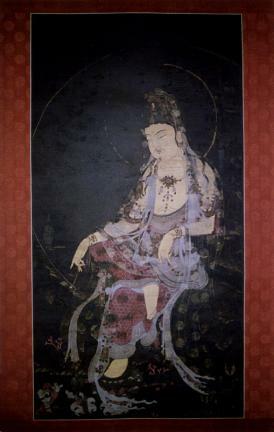 The painting of Water-Moon Avalokitesvara portrays the Pure Land where he lives. In this painting, Avalokitesvara sits on a rock with the right foot placed on the left lap and overlooks Sudhanakumâra, a scene appearing in Avatamsaksa Sutra. Behind Avalokitesvara are two bamboo trees. In front of him is a vase containing a willow twig. A circle portrayed with gold powder surrounds him. Red is chiefly used for the portrayal of contour lines and details. The ground and wrinkles of the robe were first painted in red and then in gold powder mixed with glue. Said circle contains lotus vine patterns, which are a feature of the Goryeo Period (918-1392). The part of the robe covering the lower part of the body is painted in red. It contains tortoise back-shaped patterns first painted in white and then in Indian ink. Repaired during the period 1994-1996, this piece shows that the colors have been preserved well. Overall, it leaves an impression of stability and follows the styles of the Buddhist paintings of the Goryeo Period. It displays exquisite, subdued beauty.